In this installment of our series on getting the most from your MxToolbox account, we’ll discuss our premium monitoring options and how they can save you time and money. MxToolbox is constantly striving to develop tools and monitors that save time for IT professionals. Most of our tools and monitors are included in our MxWatch monitoring packages, but a few are more complicated or require more infrastructure to support. These are premium monitors that require an extra charge. As an online business, you have a domain; that pesky “.com” thing you run use as your online presence. This domain has value to you: It’s your name online. It’s the location everyone uses to access your services. It’s how people find you now that the Yellow Pages are a historical curiosity. Since it’s so valuable, wouldn’t you like a regular report card on your domain that tells you how it’s doing? That’s our Domain Health Monitor. Domain Health analyzes your domain and automatically creates the monitors you need for your domain, including: Blacklist, DNS, SMTP and HTTPS monitors. These monitors scan your domain frequently and report on any potential issues. You get peace of mind your domain is accessible to your customers and prospects. If you’re running your own mail server, you probably have to deal with users complaining of missing messages, delays or messages not arriving at their destinations. How mail is processed through your network and servers is important and can affect everything from customer satisfaction to actual sales. An unanticipated outage could cost you money, time and customers, not to mention a few hours of work and the ire of everyone at the company. That’s why we developed our Mailflow Monitor. 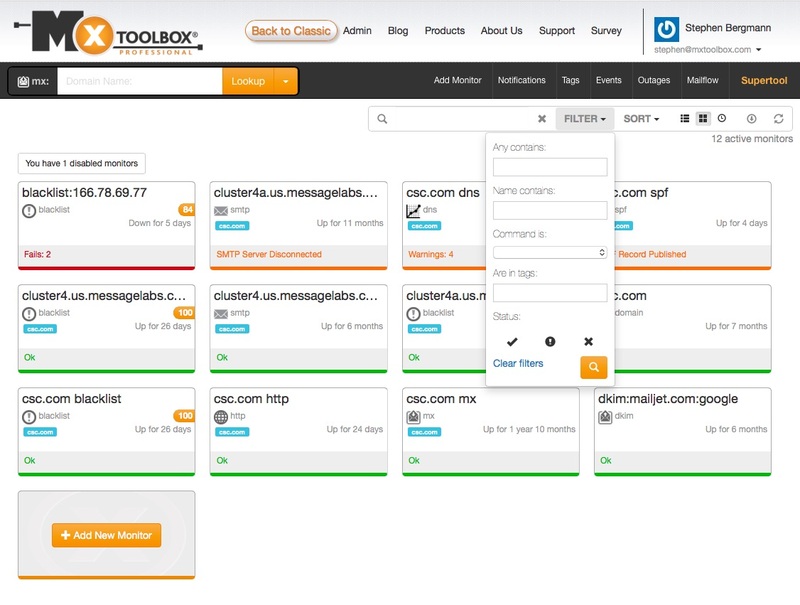 MxToolbox Mailflow monitoring is an end-to-end monitor for how email flows through your servers. Every 5 minutes, we send you an email that is forwarded back to our servers. We analyze the round-trip time and the headers to understand how the email flowed through your servers. We give you a complete analysis and alert you when our messages reach certain performance thresholds. You even get reports you can use for management. If you own a domain, you registered it at a domain registrar and then configured DNS records so that everyone on the Internet could find your website and send you email. Those records are vitally important for your domain to work properly. DNS Zone Protect is a service from MxToolbox that monitors all of your DNS records for a domain, in real time, to make sure you know for certain that your DNS is working and that all of the information is correct. DNS Zone Protect gives you two very powerful features in one simple service. If anyone, using any method, modifies any of your DNS records, you will know about it. This includes possibilities like a compromised DNS login, an attack against your DNS provider, or other possible security vulnerabilities on the DNS Servers. The method of attack doesn’t matter. If your records change, DNS Zone Protect will make sure you will know about it. The other benefit DNS Zone Protect provides is a comprehensive change history of all your DNS records. This automatic communication is vital so that everyone on your team knows exactly what is being done, in real time. We also keep a histo rical account of changes which allows you to go back and see what your DNS records were at any point in time in the past. DNS Zone Protect gives you peace of mind about all your DNS for that domain, not just the records you know about. In the next in our series we will discuss use cases, specifically, how to verify setup of an email server using MxToolbox. This entry was posted in How to Make the Most of MxToolbox and tagged Premium Monitoring on November 15, 2015 by MxToolbox Blog. In this installment in our series on making the most of your MxToolbox account we discuss some best practices for configuring your paid monitors and introduce you to Quickwatch monitors. Add users to the account – Maybe you have a small team or a colleague with which you work. Now you can share a single account and access and control your monitors. The account owner can delegate or retain authority to edit or view monitoring information. Use Tags – Have a large number of monitors or maybe monitors for specific groups within your organization? Tags enable you to logically group monitors without renaming the monitor. Create Custom Filters – Combined with tags, custom filters enable you to group monitors together in your view. Setup Notification Policies – Once you’ve added users and tags, you might want to control how certain monitors alert you and your team. Notification policies are highly granular ways of controlling how alerts notify you. A combination of these items gives you everything you need to simplify notification of specific teams or team members in the event of an outage. Have you ever made a change to DNS and then needed to know when it was finished propagating? Have you ever needed to know when a VM image was finished loading and new services were available? With our Quickwatch Monitors you can do that and more. Quickwatch enables you to set a short-term (1 to 3 day) monitor that automatically expires. During that time if the monitor detects a change, we alert you. Since the monitor automatically expires, there’s no need for you to login and deactivate or delete the monitor, it stops tracking on its own. Since Quickwatch Monitors are light and flexible, you get a larger number of them as part of your paid subscription. Use the on anything that is likely to transition quickly and it’ll save you time rerunning queries on the site. In our next installment we will discuss premium monitoring options to make your job even easier. This entry was posted in How to Make the Most of MxToolbox and tagged Paid Monitors on November 10, 2015 by MxToolbox Blog. The latest in our series on getting the most out of your MxToolbox account discusses some of the benefits of a paid subscription. While most of our customers use MxToolbox for free (and we encourage that! ), many of our customers need more monitors and monitoring options to make their work even easier. MxToolbox offers affordable monthly subscription packages that include a flexible number of monitors (IP and Domain Blacklists, SMTP, TCP, DNS, HTTP/S) combined with advanced tools. MxToolbox is committed to making life easier for Network, Email and Systems Administrators, people who work on IT infrastructure on a daily basis. As part of that, we are constantly looking to add new tools that simplify repetitive work. (We hate doing the same thing every day too!) Some of these tools may require a paid subscription, but we will never make our free tools paid. The DNS Batch Tool is the first in our new line of premium tools, tools included with a paid subscription and featured in the Professional interface. This tool enables you to input unstructured text and run batch DNS queries on the IP addresses contained therein. This is particularly useful for someone analyzing an event log, say from an intrusion, or network routing tables. The DNS Batch Tool saves you time pulling all the relevant IP addresses, sifting through them and then running multiple queries to determine what IP could be the problem. We do it all in batch and even send you an email of the results, if you would like. In our next installment, we will discuss the benefits of the additional monitoring options you receive with a paid account. This entry was posted in How to Make the Most of MxToolbox and tagged Paid Monitoring on November 7, 2015 by MxToolbox Blog. This is another in our series on getting the most from your MxToolbox account. Today we discuss adding a free monitor. When you register with MxToolbox, we give you a free monitor. You can use this free monitor to monitor IP blacklists, SMTP, TCP ports, or HTTP/HTTPS. Simply go to the Add Monitor page, and select the type of monitor you would like to add. 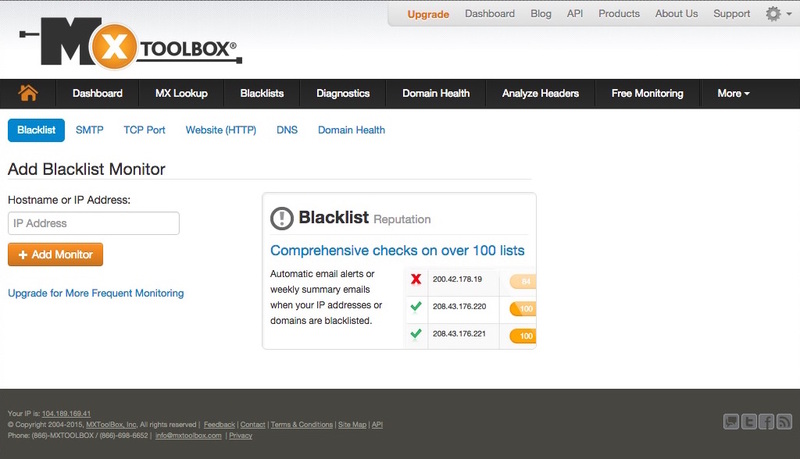 Note: You may see options for Domain Blacklists, DNS, Mailflow and Domain Health monitors listed on this page. These monitors require a paid subscription. 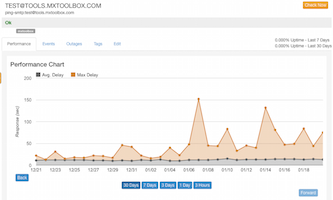 MxToolbox monitors constantly check the status of your servers and report any issue that might compromise your service. There’s no need to periodically run lookups, we’ll let you know if something changes. You can relax knowing that MxToolbox has your back. We highly recommend that all free users register and setup a free monitor on whatever server they find the most important, troubling or time-consuming. The best candidates for monitors are lookups that you perform often or are mission critical. If you find yourself checking your email server daily for SMTP setup, then create a monitor. If you are concerned about a blacklisting event stopping your business, add a monitor. In the next installment, we will discuss the benefits of paid monitoring accounts. This entry was posted in How to Make the Most of MxToolbox and tagged Free Monitors on November 5, 2015 by MxToolbox Blog. This is another installment in our series on getting the most from your MxToolbox account. Today we discuss a few useful network tools. There are times when you just need to check your network from outside. Is this server detectable? Did I leave the right port open on that firewall? Is the service up and running? More advanced setups, complex server or network configurations may require different tools. 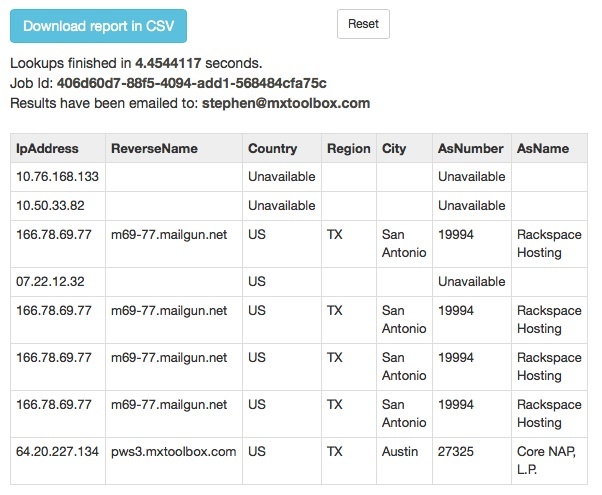 MxToolbox has a suite of tools for testing servers on your network. Ping – Use it to see if a server is accessible and “alive” to traffic from outside your firewall. TCP – Check a port on a server to see if a service is running. Port Scan – Scan your server to see if various common ports are open to outside traffic. MxToolbox has many more tools for network administrators but these listed above will get you started. In our next installment, we will discuss free monitoring options. This entry was posted in How to Make the Most of MxToolbox and tagged Network Tools on November 1, 2015 by MxToolbox Blog.